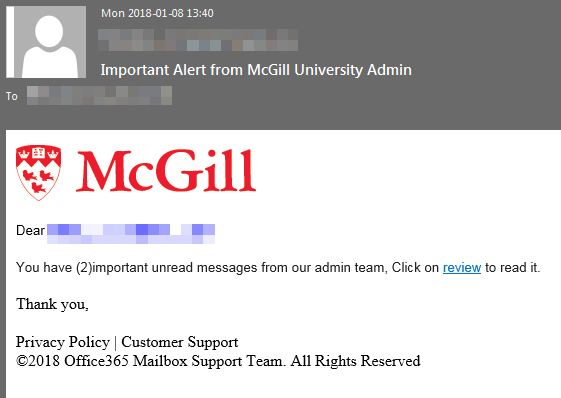 If your McGill account was already compromised, it may have been locked by McGill Information Security; in that case, you must contact the IT Service Desk (514-398-3398) to unlock your account. If you have received a phishing email or suspect that you have, please report it, by sending the message as an attachment to phishing [at] mcgill.ca immediately. This is to notify all Students, Staffs/Faculty, of MgGill University that we are validating all McGill network user accounts. ©2017 Office365 Mailbox Support Team. All Rights Reserved.